Nutella is perhaps the world's most famous chocolate and hazelnut spread. Sweet and rich, it is divine on toast for breakfast, in a peanut butter sandwich for lunch, and as a topping to a favorite dessert. But Nutella, surprisingly versatile and easy to work with, can do even more than most realize. The book is whimsically trimmed and bound in the shape of a jar of Nutella and is divided into sections such as little Nutella treats and Nutella for sharing that make it easy to find the perfect Nutella recipe for any occasion. Better yet, each recipe is accompanied by a gorgeous full-color photograph making the book even more mouth-watering and irresistible. 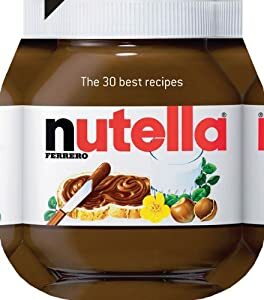 NUTELLA: The 30 Best Recipes is the ideal recipe guide for fans of this most-loved of chocolate treats both near and far! As I looked through this cookbook, there were many choices: souffles, croissants, creme brulee, pana cotta, mini swiss rolls, macaroons, and on and on. It was difficult to decide which recipes to try but I knew I wanted to try something my girls could do with me and enjoy eating. So the first recipe was the Mini Nutella Croissants. The recipe was easy enough to make. I allowed the girls to taste the Nutella first and they were hooked. So making the croissants and knowing the taste testing after they were out of the oven was an added bonus to their cooperation. The directions were very detailed. The measurements were given in metric and our USA measurements. This recipe was easy to make and the end result was delicious. The next recipe I made was on my own. I had purchased a mango and the recipe required a mango so I decided to try it. Both of the recipes I chose used puff pastry which is easy to use. This recipe used the Nutella, finely chopped mango, the puff pastry, and slivered almonds. It was delicious and the mango, Nutella and almonds was such a nice combination of flavors and a little crunch. I took the final product to a friend's house and she and her family enjoyed it. So many more recipes to try. If you like Nutella, this recipe book will give you many opportunities to use it.